If there is one feature that is almost sure way to turn me away from site it is multi-page articles. It is debatable if that approach serves some purpose or not, but it is a fact that some sites stick with it. I knew there are tools to deal with that in theory, but nothing really jumped at me as viable solution for Opera. Today I wanted to skim article on PHP IDEs (I currently use NetBeans) and remembered that Samer recently posted about PageZipper tool to sew multiply pages of article together. PageZipper comes as bookmarklet (and there is also Firefox plugin version). On activation it adds small toolbar in the corner of the browsing area and attempts to detect following pages in the article. When you reach end of the page next one is dynamically loaded at the bottom. 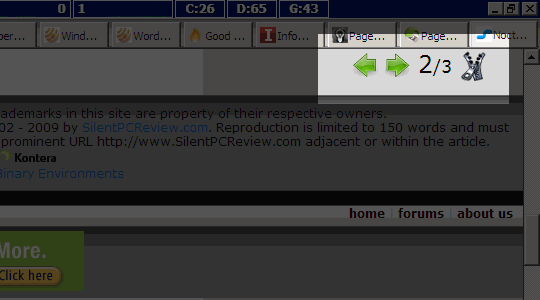 You can quickly jump from page to page using buttons on toolbar or Ctrl+Up and Ctrl+Down shortcuts. Bookmarklet was developed by same people that made PrintWhatYouLike (see my roundup of tools for cleaning up articles for reading) and they are good at this stuff. Core function works really smooth on few pages I had tried (including SilentPCReview, one of the few sites with paginated articles I read often) . Reading experience becomes much better than jumping from page to page. Process is very seamless and without noticeable slowdowns (although my recent upgrade to SSD made slowdowns much harder to notice). Naturally this won’t work for every site and that’s not really downside – just complexity of the task. What had really failed in my case is additional functions that are aimed to simplify browsing images and resize them to fit window. This part simply didn’t work for me, most probably compatibility with Opera doesn’t stretch that far. Also Ctrl+Arrows hotkeys are mapped in Opera for navigation purposes and that makes them unusable with bookmarklet (unless you reconfigure Opera hotkeys). Since pages are used in full when merged this can make really large header plus footer area between chunks of article. On sites with extensive footer areas this gets annoying to scroll through . Would be great if bookmarklet recognized and prioritized actual content. Not ideal by nature of task, but does great job when possible and saves plenty of clicks and nerves. Very solid and useful bookmarklet. « Do you read any sites for comments alone? Will check it out. I hardly use userscripts – not exactly straightforward thing to setup in Opera. :) But seems I will have to try and use them more actively some day – I am probably missing out on plenty of stuff. What I like about bookmarklets is that they are as easy to manage and use as (well) bookmarks.